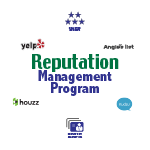 The BeRespected option of the Reputation Management Program includes the 24/7 review monitoring and alerts found in the BeSocial option plus a custom review funnel website making it easy to prompt customers to leave positive reviews. In addition, to making it easy for happy customers to leave a review, this system automatically prompts unhappy customers to leave their comments privately, giving you time to react prior to public posting. Also, we create custom printed marketing material to improve the review invitation gathering process. BeRespected is our mid level option of the Reputation Management Program. To view our entry level and top level offerings, please review the BeReputable and BeDistinguished options.